Today was my first day teaching at Bang Khonthii Primary School, a 60-student facility in the Bang Khonthii Amphoe (roughly, “county”) of Samut Songkhram province about 80 km southwest of Khrungthep. About three weeks ago I visited the school while on a Spiceroads bicycle tour and started speaking with the Ajarn Yai (literally, “big teacher” – the principle) and she asked if I’d like to volunteer and teach her children English. It sounded like a good opportunity, so last week I headed back to the school to sign up. This morning I left home at 6:30 to ensure I’d be there before class started at 8:30. Nervousness and anticipation were rampant as I didn’t know exactly what to expect. Ajarn Yai was very happy to see me and she and her staff were quite accommodating. After some discussion about where the students are in their English studies, I went ahead and started teaching the first class. Perhaps I thought one of the teachers would remain in the classroom with me, but I was pretty much just thrown right in! The first group was the combined grades 4-6. Originally, I thought these were the students from grades 1-3 but it wasn’t until I walked into that classroom after lunch that I realized my mistake! Each class is about 20 students with the remaining 20 in a combined preschool/ kindergarten. The older children were pretty knowledgeable with their English as I started with very basic things, colours, numbers, etc. and worked to more complicated things. Now that I know where they are, I think I’ll try some more challenging activities in weeks ahead. We enjoyed a fun round of “Head, Shoulders, Knees and Toes” in which I threw them off by pointing to body parts in a different order. We also started to learn “The Itsty-Bitsy Spider,” which they already know in Thai. Perhaps you can see now how I thought these were the younger children. Had I known their grade, maybe I wouldn’t have done the singing. But they had fun. After lunch, which the school provided (gread pad thai and chicken with rice) and I ate with Ajarn Yai in the office/teacher’s area, I taught the younger children. We spent about an hour learning and spelling different fruits. Their writing is very good, quite neat. 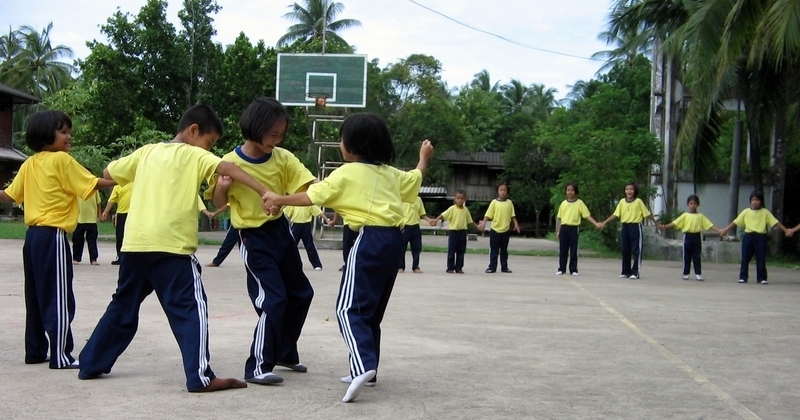 We then did our own round of “Head, Shoulders…” and then decided it was time for some recess and went out to play “Red Rover, Red Rover.” There’s a slightly different version in Thai so I had to teach them the new way. They added a uniquely Thai twist to it, nonetheless: When one time dwindled down to a single remaining student (in other words, the game was over by a traditional definition) several students from the other side ran over to join him so the game would continue. Every Thursday is music lesson day. In following weeks I’ll go there on Wednesday instead so as not to disrupt the schedule. 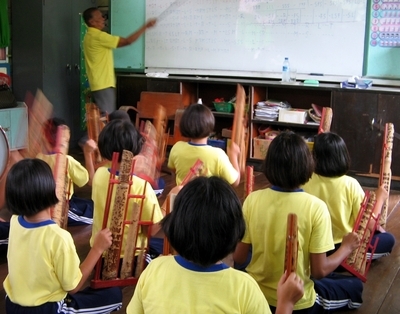 However, since I was here, after lunch I sat in for a while as grades 4-6 practiced playing music using traditional southern Thai-style instruments that are made out of bamboo. The name escapes me at the moment, but they sound a lot like a xylophone, but a xylophone with a note being struck repeatedly in quick succession. All in all, it was tremendously fun. I have a lot of work to do to prepare for next week: each class is 2.5 hours long so there’s a lot of time to fill and like all young people, attention spans are short. If you know any ESL teachers or early primary school teachers in the US please let me know – I could use some lesson plan ideas! As a positive aside, my Thai is going to improve really rapidly by doing this, since none of the teachers speaks any significant amount of English and Ajarn Yai, while speaking some English, pushes me to speak in Thai most of the time. On top of it, especially with the younger grades, I have to use Thai for the instructions because they don’t know the words yet in English! They just hired you with no lesson plan and you have to make it up as you go!? Good job! Yeah, it was a little… strange. Since I’m not a paid employee and just a volunteer tutor, I guess the idea is that whatever I do, playing games, reading, talking with the students, will improve their understanding of English. I suspect that the language barrier itself proved to be the biggest obstacle to any interview.